Discover benefits of olive oil! It is cold pressed from the olives of the Olea Europea tree. Olives have a sweet, fleshy, outside layer and a small seed inside. They grow slowly and are harvested when they become a greenish-purple color. They have a bitter taste. Olive oil has different grades: extra virgin, virgin, pure, pomace and lite. Their colors vary from a dark green to a light yellowish-red, due to processing. How do you know the best olive oil for you? High quality olive oil has a dark, robust, green color. This color is found in the extra virgin type. If extra virgin olive oil has a lighter, yellowish color, it was probably pressed from low quality olives. The following descriptions distinguish between olive oil types. EXTRA VIRGIN OLIVE OIL: Least processed. Derived from the first pressing of olives. Contains high amounts of nutrients and vitamins. Has no additives. Oleic acidity level is less than 1%. Valued for its perfect balance of flavor, aroma, color and acidity level. Has superior taste and light, delicate, texture. VIRGIN OLIVE OIL: Produced from the second processing of olives. Has acidity level of less than 2%. Has more intense flavor. PURE OLIVE OIL: A blend of refined and virgin olive oil. Has small amounts of vitamin E. Acidity level is less than 2%. Has lower nutrient content and is less expensive. Suited for high temperature cooking. POMACE OLIVE OIL: Lowest grade of olive based oils. Produced from the residual oil left in the olive's pomace. Blended with varying amounts of virgin olive oil to make it acceptable for consumers. Used for high temperature cooking. Less expensive. LITE OLIVE OIL: Pure rectified oils containing tiny amounts of virgin oils, if any at all. Oils are light in taste and color. Contains the same amounts of calories and fats as all olive oils. Poorer quality. TIP: Try "organic" olive oils. Make sure to read the ingredient labels making sure it really is "organic", with no added ingredients. RENEW SKIN CELLS: Has antioxidants! Neutralizes free radicals leading to skin cancer and aging skin. Rich in vitamins A, B, C, D, E & K.
ANTI-INFLAMMATORY: Contains oleocanthal, a soothing enzyme, for relieving pain & inflammation. MOISTURIZE & LUBRICATE: Accts as a humectant drawing in and hlding moisture with a light protective layer. Mild and gentle. Useful for dry, flaky, chapped, mature and sensitive skin. GLOWING COMPLEXION: This homemade face mask is quick and easy. Mix together fine coffee grounds and olive oil. Gently massage on face. Leave on for approx. 30 seconds. Rinse with water & wipe away. Pat dry. COMBAT CELLULITE: Apply olive oil to problem areas. Mix together 1/2 cup of coffee grounds and 1/4 cup of brown sugar. Apply mixture, in circular motions, on top of problem areas already coated with olive oil. Rinse scrub, thoroughly, in shower. Try this twice a week before any noticeable difference. This is not a cure or long term solution. 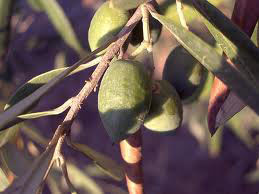 COMBAT DRYNESS: Apply olive oil directly to elbows, face (avoiding eyes), feet, legs, scalp, hair, nails and lips! An olive oil bath is another way to soften and moisturize by adding 1/4 cup of olive oil to bath tub of water. A drop of lavender or peppermint oil adds soothing properties. This homemade shampoo bar contains olive oil. It controls dry, frizzy, hair and helps get rid of dandruff. It improves dry scalp conditions and protects against scalp build-up. If you're making homemade shampoo, olive oil can improve hair and scalp conditions! You can also apply a small amount of olive oil directly to hair. Either comb in or gently rub on scalp. CAUTION! Over use can make the hair feel weighed down. Use sparingly. A little bit goes a long way. OTHER BENEFITS OF OLIVE OIL: Lubricate scratchy throat. Tame dry, frizzy hair. Relieve earaches. Lubricate squeaky door hinges. HEALTH BENEFITS OF OLIVE OIL: Lower LDL (bad cholesterol), Raise HDL (good cholesterol), Lower risk of heart disease. Extra virgin and virgin oils have high amounts of polyphenols and a powerful antioxidant, which helps prevent cancer.